Motherhood turned life into an obstacle course for Julie. She juggled multiple duties and never focused on herself. See what sparked her devotion to transform and inform! For most of my life, I was lucky to never be overweight or suffer from major health issues. I didn't know anything about nutrition growing up and ate everything in sight. We had a nine-person family and it was hard to turn down food. I had a "get it before it's gone" mentality when I moved out and went to college. I didn't play any sports and I wasn't especially active. I feel fortunate that I wasn't overweight at that point in my life. I got married and had two beautiful girls, but I didn't feel happy. I couldn't lose the baby weight and I felt tired, depressed, moody, and unhappy. I had a wonderful family with a low-stress life, but I wasn't happy. It mostly stemmed from low self-confidence. I looked in the mirror and couldn't accept that I would live in an ugly body for the rest of my life. I decided to prove the "mom theory" wrong. I wanted to feel better about myself, increase my energy, stop feeling down, and love my body. I started learning about eating healthy and started exercising at home while the babies slept. Then I joined a gym and lifted weights. At first, I was afraid to try exercises in front of others, but my confidence increased with my strength. Soon thereafter, I felt better about the way I looked, felt, and performed. I didn't care if people saw me try new exercises or get tired from the last few reps. Combining exercise with healthy food changed my life. I had way more energy and was in a better mood all the time. I was leaner, stronger, and more confident. I'm healthier now than I was in high school. I'm glad our little girls will grow up knowing how to love and nurture themselves. Society makes women think their bodies aren't good enough, but I plan to show them otherwise. I started with an "all or nothing" attitude. I went through my cupboards and gave away food I didn't want. My husband transformed with me. I was extremely lucky to have that built-in support. He did and still does the majority of our grocery shopping so I don't worry about wanting something unhealthy. If I go grocery shopping, I make a list. I don't waste food or buy junk food and only buy a week's worth of food at most. I lived close to the gym and walked or did sprint intervals there to burn extra calories and improve my health. I lifted weights four times per week. There was a child room at the gym for parents to work out and watch their children. I brought dumbbells, barbells, and kettlebells into the room to watch my girls. I usually walked them to the gym and back, and packed snacks, drinks, diapers, and extra clothes (anything I needed so I wouldn't need to stop my workout completely). There were times I looked in the mirror and felt discouraged seeing my stretch marks and cellulite. 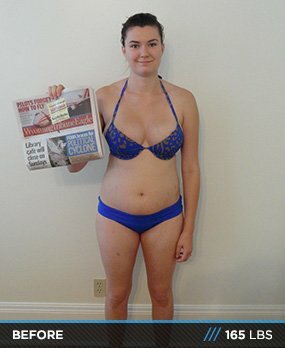 The transformations on Bodybuilding.com provided encouragement to keep going. Seeing other moms transform helped. I realized it would take time and concentrated on my little successes. I prefer to get most of my nutrients from food, but there are times I need a little boost. I love vanilla protein, because of its versatility; I add fruit, cinnamon, peanut butter, and oats to it. I also love banana and strawberry flavors. I like to eat real food without counting calories and I listen to my body. Everyone lives in a different environment, but it's vital to understand the difference between habitual eating and eating for energy/nutrition. I love variety. The only reason I eat the same meal for few days is for cooking convenience. Give your body the best variety of nutrients from real food as possible. Real, fresh food has phytochemicals that processed foods don't. These help you stay young and protect you from illness. Eating real food heals the body and allows it to function efficiently. If I'm sore or exhausted, rest is more important and beneficial than working out. Strength is beautiful physically and emotionally, and lifting weights gives you both. I gained much more self-confidence when I started lifting. My body strength surprises me. It makes me stronger emotionally. I'm doing everything I can to be the strongest possible. I'm not perfect, but I give it my all. Abs are made in the kitchen. People should do more than lift weights to be in shape. Take a dance class or go skiing for fun, but by stay active and your body will get core exercise. By eating healthy, you will lose fat and reveal abs. I did interval cardio once per week until three weeks before the competition. Moms face a huge challenge to find people to watch their kids while they work out or they have to bring them along. Because I grew up eating processed foods, it was hard to cook and eat real food. I love it now, but it took awhile before I enjoyed the taste. It's hard to turn down party snacks or potluck goodies. Now I use those occasions as treats and keep my pantry and refrigerator cleanly stocked. The biggest challenge was changing my eating habits with two young children. There were many times that I was so busy changing diapers and caring for the kids that I barely had time to care for myself. I learned to make time for myself, which most moms know can be hard. My life changed so much in the last year. I finished a transformation, became a personal trainer, competed in my first bodybuilding contest, and qualified for nationals. I learned about my body, how to be a trainer, and what it takes to compete. The biggest lesson I learned was the importance of nutrition. People are more concerned with image than health. They over-supplement or under-eat. Be satisfied with your body in the healthy stage. I never thought I would be satisfied with my body, but now that I'm stronger, healthier, and happier, I finally am. I love what my body did for me. I want to learn more about nutrition and possibly start a career in the field. I'm starting a weight loss program for women so I can provide them with tools to take the step. Keep reminding yourself why you are doing it. Use little successes as motivation and track your measurements. Keep a variety of foods in your diet. Focus on performance rather than on weight or inches. Take care of and focus on yourself. 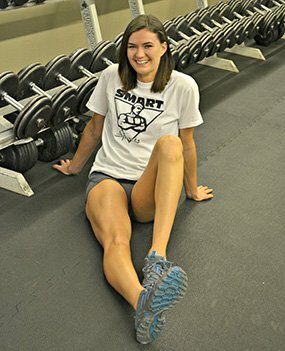 Bodybuilding.com has many transformation stories that are extremely inspiring. It's hard to believe people can transform like the pictures show, but you will believe it when you get there. You can find different plans for workouts, supplements, and nutrition on the site and use their articles to gain knowledge. The biggest help was using BodySpace to track my measurements and progress pictures so others could show support. I didn't want to put pictures of me in a bikini on other social networks.